Happy Halloween!!! From the first time I saw it, I knew for this day I HAD to wear Deborah Lippmann Bad Romance on my nails. First, the combination of black and purple is spoooooky. Second, this is the polish she created for Lady GaGa, whom I have had aspirations to dress up as since, oh I don't know, March. Bad Romance is a black base with two sizes of purple glitter: small regular glitter and big hexagonal glitter. The black base is sheer so I needed three coats for complete opacity. When the polish dries, it has an uneven texture that reminds me of purple boils on a witch's skin. It's a look that's growing on me, but I added a coat of seche vite to smooth things over. Look at how pretty the bottle looks! 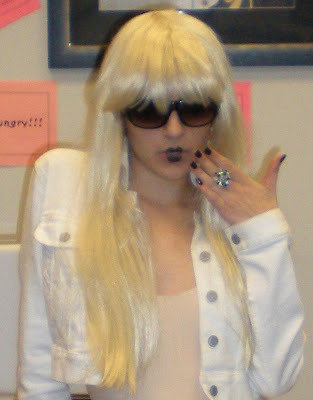 And because this post wouldn't be complete without a picture of my costume, here is me being Lady GaGa. The nails were the perfect touch, don't you think?! French Horn player, caffeine addict, Francophile, polish lover.